This is our Leap Day Box – freshly spray painted. 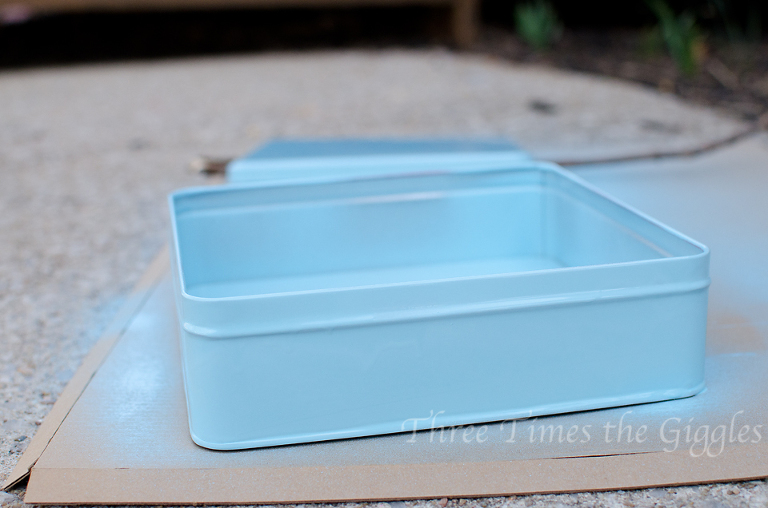 You really could use any type of sturdy container for the box, but I chose to repurpose a cookie tin! A snapshot of your kids, pets, your house maybe, anything at all! Let the kids help direct the project, that makes it more fun for them. I’m going to have the boys each draw a self-portrait to put in the box. Ask your kids a series of questions and record their answers for the box. I’m going to ask things like: favorite color, best friend, favorite book, favorite food, what they want to be when they grow up, etc. For Lily I’ll just write down some fun things she loves (like turning off the TV on her brothers). After you’ve got your stuff in the box, put it on a shelf somewhere. In 4 years, when the next Leap Day comes around, pull the box out! Your family will have a ball looking at the stuff from this year and laughing at some of the answers and drawings. Then, do all of the same stuff again and add it to the box! With the current age of my kids, I figure I’ll get to do this for the next 4 Leap Years (at least with Lily)! What a fun, family time capsule of sorts. So, who is going to join us in making a Leap Day Box? That’s so true, Mom! I should have Nick and I answer some questions too!